Four Flowers III has a handsome, vertiginous aft profile. The centrepiece is the beach club. Plenty of yachts pack on spaces for both day and night, ushering guests from sun-soaked beach club to pumping nightclub via a couple of flights of stairs. 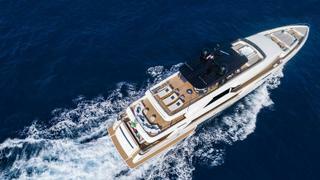 But fewer designs handle the transition as skilfully as the Ferretti Group’s first Custom Line Navetta 42 Four Flowers III. Its interiors are planned to guide guests to different areas at different times, creating a gentle flow through the phases of the day and making sure you’re always in the perfect spot. 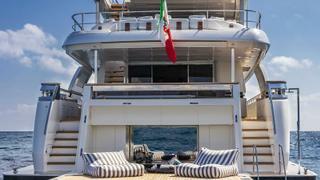 Four Flowers III is the owner's third yacht built by Ferretti. All images by Alberto Cocchi. The Navetta 42’s exterior lines may be a constant, but the platform’s interiors can be customised with a wealth of optional features that range from finishes to fold-out terraces and engines to lifts. The choices are so many and varied that a full package of options would be practically impossible to put together on one boat. “We supply the owners with a sort of seafaring container where spaces, workflow and liveability have been planned. The owners then call in their own designers to choose optional features and to customise the furnishings as they please,” says Zuccon. Needless to say, when the yacht was finally unveiled at its launch in Ancona, a feeling of joyful surprise spread throughout the entire shipyard. 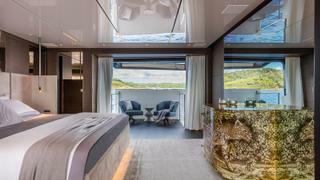 Interiors architect Luca Bombassei, who knows the owner’s family well, combined walnut, dark oak, burnished steel and tinted glass for stylish, moody interiors that create a day-to-night flow through the yacht’s social areas. Furniture from these brands is used widely in the yacht, but the interiors never look like showrooms. “Bombassei is really good at mixing it up, adding pieces from the owner’s collections to personalise the atmosphere,” continues Menin. 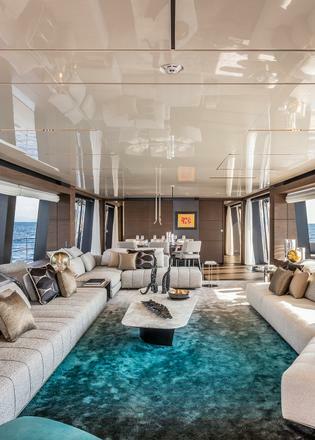 In fact, a large tempera painting by Francis Bacon at the main saloon entrance, an embroidered piece by Alighiero Boetti by the dining table and a sculptural floor lamp by the 20th-century Italian designer Tommaso Barbi set the tone for art and design that continues throughout the yacht. “The furniture becomes the background for these pieces,” says Menin. Whereas structural areas on the main deck aft are all white, on the upper deck aft they are white towards the water and black towards the interior, like a day that is fading into evening or a night on the cusp of day. A large curved sofa at the stern faces a black glass table under the overhang, where up to 10 people can comfortably enjoy a meal together. The doors to the upper deck saloon can be opened completely, eliminating any physical or aesthetic boundary between the two spaces. 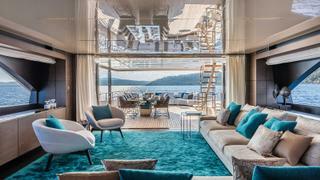 The saloon carpeting is a solid aquamarine colour that seems to ripple depending on which direction you view the pile from, mimicking the effect of sunlight on deep water. Low sofas by Minotti and mid-century-style armchairs complete the living area and there is a small coffee table alongside open shelving used to display treasures from the owner’s collection. 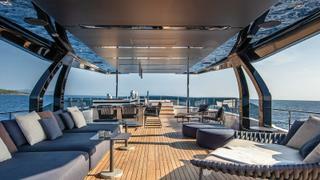 “The architect really wanted to create a nook in the otherwise expansive upper deck saloon,” says Menin. “A corner for reading, playing cards or just for having a cup of coffee. He did a really good job of creating a space with bookshelves and furnishing it with a low table and seating.” The sundeck, with its black hardtop and balustrade in dark tinted glass, has a nocturnal atmosphere that makes “moondeck” seem a more appropriate name. Low modular sofas and poufs in dark grey upholstery are flanked by black cocktail tables, while semicircular lounge chairs like woven birds’ nests invite you to curl up and crash out. An informal dining area is modelled on a sushi bar and the styling is so individual that it’s almost surprising to find that sundeck staple, the spa pool with sunpads, integrated into a side of the bar. Bombassei has transformed Four Flowers III into what feels like a club for initiated members only. But there’s also a real club aboard: the beach club that is accessed via symmetrical staircases from the aft deck and dedicated solely to sun and fun. 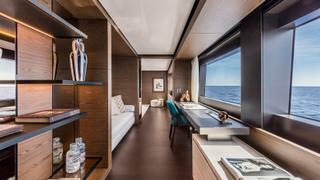 If the social areas on board the yacht seem exclusive and almost esoteric, the cabins are all democratically finished in the same materials. 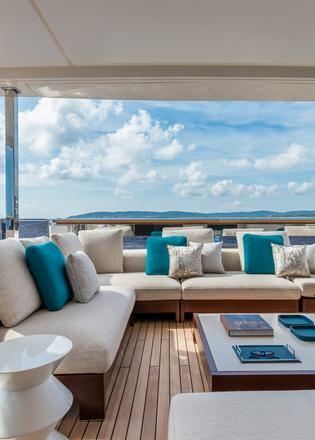 The owner’s suite on the main deck is full beam with an opening terrace. Some of the cabin’s long glazed surfaces have portholes in them, but others slide down at the touch of a button, automotive style. A dresser by the great 20th-century Italian designer Piero Fornasetti is placed in front of a floor-to-ceiling mirrored panel that conceals a TV and just beside it, picking up the dresser’s black and white tonalities, is a pen and ink drawing by Picasso. “Bombassei paid special attention to the owner’s suite,” says Menin. “He knew that he wanted to keep the television hidden and that he wanted to use some high impact pieces in the furnishings. The use of the mirrored panel solved the television problem, provided a proper backdrop for the Fornasetti piece and also made the cabin overall seem larger. It was the perfect choice,” he says. The same materials that are used in the owner’s suite are picked up in the four guest cabins on the lower deck, alongside works from the owner’s collection of top contemporary photographers. The Navetta 42, with its functional and seaworthy platform designed by Bernardo Zuccon, could well be a yacht for travelling around the world. That platform as interpreted by Luca Bombassei becomes Four Flowers III, a yacht for rocking around the clock. With five more Navetta 42s already in the pipeline, keep an eye out for more variations on the theme in the near future. This feature was originally published in the December 2018 issue of Boat International.